Looper offers an interesting and fairly unpredictable narrative, good acting and some unavoidable for a time travel sci-fi movie flaws. Independently of the flaws though Looper is one of the better sci-fi films of 2012. Looper's action is set in 2 different years, both in the not so distant future. In 2074, when the mob wants to kill someone and get rid of the body, the best possible way is to send the victim into the past. In 2044 a group of assassins called "Loopers" waits for the victims sent from the future and eliminates them the very moment they "land" on a specific place. Sometimes the older self of a particular killer is sent back from the future to be killed by his younger self. This is called "closing of the loop". If the man from the future escapes for whatever reason problems arise for the unsuccessful killer. Joe (Joseph Gordon-Levitt) is one of the 2044's assassins, which gets into real danger when Old Joe (Bruce Willis) "arrives" in the past with more than a simple view of defenceless dying. 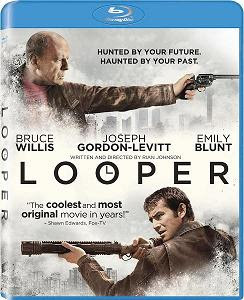 Looper is a well directed movie based on potent ideas. Except for the younger-older self connection there a few other themes incorporated into the movie like a love story, preventing the loss of a cherished person or a complicated mother and son relationship. The story is competently constructed and there aren't almost any redundant episodes. The film rarely feels boring and you do not know until the very end how Looper is going to wind up although a few possibilities may have crossed your mind. The cast has done a fine job too. Joseph Gordon-Levitt and Bruce Willis are good in their impersonations of a same character. Actually this is probably the best movie starring Bruce Willis in recent years. Emily Blunt and Paul Dano have also notable performances in Looper. And Jeff Daniels has a few episodic but memorable appearances as the mob's representative in the "past". Despite all of the praises above Looper has also a few flaws, some of which inevitable. As with every other time travel film each transfer of a man into the past (or into the future) immediately brings forth common problems related to the existence of more than a single timeline and its manipulation. This is very similar to the chicken-or-egg problem and of course, Looper is not a movie that avoids it. The film reveals some other less excusable issues too, e.g., the impossibility of the mob in 2074 to get rid of people in their own time seems ridiculous especially when simultaneously men are so advanced they can use time machines. Another not so clear point is why a looper should kill his own older self instead of assigning this tricky task to a colleague. Regardless of the few issues, Looper tells a sound science fiction story. The plot is solid, entertaining and keeps you involved throughout the whole movie. The film is mandatory for lovers of the sci-fi genre but most casual moviegoers will also have a good time watching it.